This beautiful Monarch I encountered two years ago was caught in a web and died. Little did I realize it at the time, but this image represents an omen for me now. The disappearance of this butterfly species is very apparent. 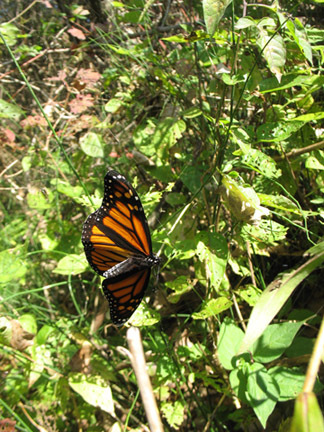 Last year (2013) I saw only four Monarchs in Toronto. I was expecting to see these magnificent beings all over as I had previously. The diminishing population of Monarch butterflies in Ontario is directly influenced by the loss of the milkweed habitats in the United States. In order to breed new individuals who will make it up to Canada, the Monarch must lay eggs on the milkweed plant. That is the only plant the larvae of this butterfly can eat. This speaks volumes for the advantage of adaptation and biodiversity; it also speaks volumes about how human interference with the natural environment has dramatic finalizing impacts on other species that inhabit the planet. This reality can only be changed through a change in attitude and priorities regarding Life on Earth. It must be a global change; it must be a collective change; it begins with individuals acting and speaking publicly in ways that validate living in harmony with Nature. David Suzuki's outreach through education and example is one path we can look to for a model. He has a website that focuses particularly on the plight of the Monarch butterfly and suggests steps ordinary citizens can take to help the situation out. What I have noticed more often these days are the other butterfly species that thrive in this region. Red Admiral and Tiger Swallowtail are two I have seen this summer. Their presence flitting around plants and in the air is some comfort to me. Nature fills in the gaps when one species disappears–at least for now. How many species will be lost before we come to the point where no replacements are available? These thoughts can be disconcerting to say the least. I do feel so grateful that I lived in a time when the Monarch was plentiful and I could experience one landing on my shoulder, see thousands of them gather above a rock concert a City Hall and take close up photos of them. Now I can only honour the memory of their life cycles and heroic migrations and beautiful displays by recognizing what they mean to me in dreams, memories and personal imagery. In a dream long ago, the Monarch was a harbinger of immanent change in my life, and in another image, I recognized the stages of the Monarch's cycle as an explanation of suffering as part of the inner journey of the soul.